Maglev Wind Turbine Technologies (MWTT), a developer and manufacturer of magnetically levitated commercial wind turbines, has officially begun operations. According to the Sierra Vista, Ariz.-headquartered company, with the use of magnetic levitation turbine technology, the wind turbine floats on a magnetic cushion and incorporates a linear synchronous motor. MWTT says that because the lack of friction allows for increased wind capture, users can generate electricity for less than $0.01 per kWh. The company is headed by Ed Mazur, a researcher of variable renewable energy sources since 1981. Chinese developers unveiled last year the world´s first full-permanent magnetic levitation wind power generator at the Wind Power Asia Exhibition 2006. A NEW breed of rural investors has purchased thirty two million square foot of O Ribeiro in Galicia, in order to preserve a forest there and allow for further reforestation. For Pablo Oitabén it is a lifelong dream that began at Ridimoas, his father’s finca in O Ribeiro. As the woods surrounding the farm became ever threatened by encroaching urbanization, the teacher decided to facilitate some ‘development’ of his own. Hence he began the association Ridimoas, which allows people to buy a piece of threatened forest for as little as 10 euros (14 dollars). When the project was first underway and the dream became reality, Oitabén hoped to expand the protected area by one hectare per year. However, exceeding all expectations, the project already has 300 hectares – purchased by a group of more than 1,000 “green investors” from as far a field as Venezuela, Switzerland, Germany and Canada, as well as Spain. Pablo initially intended the forest as a place to bring injured birds to recuperate, as well as somewhere for his pupils to visit to learn about nature and the environment. But the project soon escalated thanks to the eager buyers, as well as grants from the Xunta de Galicia regional government. Today, the forested lands around the Beade mountains are so large, it is possible to maintain untouched protection areas to allow the deer, foxes, wild boar and otters to live among the hazels without human interruption. There is space left over for visitors, and opportunities for dedicated volunteers to get involved with conservation and reforestation projects. Oitabén was delighted to be involved in a documentary film about wolves, not least because his salary from the project could be channeled into the forest preservation scheme. This is not the only brush with the big screen Ridimoas has enjoyed: butterflies from the forest were used in the film La Lengua de las Mariposas (Butterfly Tongues). Once again, the funds obtained from this were used to enrich the reforestation project. Support for the venture has not just come in a financial guise: a mare found injured and abandoned in the region was ordered by the courts to be donated to the Ridimoas forest. The recuperated horse now serves as Pablo’s trusty steed, as he rides around the woods each day to make sure all is in order in the area. During the summer months he has to be especially vigilant in the face of the risk of forest fire. All the data obtained through observation of the wild animals, timber extracted from the forest, temperatures and daylight hours goes to a log that is sent weekly to the NASA program “Globe” by the local school. The rest of the time, Oitabén is concerned with haggling with local landowners over the surrounding terrain and making arrangements to buy plots to extend the forest. The ever-expanding boundaries of the protected area show no signs of slowing – under the ruthless forestal development of Paco Oitabén and his devotees, Ridimoas is biting back at the concrete jungle. Philippine National Oil Co. and the Spanish firm Isofoton signed an agreement last month during the Conference on Renewable Energies in Madrid, Spain. The purpose of the alliance is to develop a photovoltaic (PV) solar energy project in the Philippines. Isofoton will help the government source the necessary funds to pursue and promote the solar PV rural electrification program of President Gloria Macapagal Arroyo. The estimated cost for the project is between 14 and 21 million US dollars. Once the project is completed, he said they expect to install a total of 15,100 solar home systems in the country. These sort of projects are a steady bet of the Spanish energy leader Isofotón, which has a solid portfolio of renewable energy projects in developing countries. Their business model has two focuses: it aims to provide developed nations with a real energy alternative, and in terms of energy development, to trigger development in low income areas of developing companies. Currently, the company is installing solar energy systems in remote villages in Morocco where the national network does not reach – a step further in the rural electrification policy (PERG). Through its Moroccan subsidiary, Isofotón will install 34,500 PV systems in villages of Morocco where solar power is the only possible energy alternative. Isofotón coordinates both the commercial and technical aspects of the project. Once installed, the company makes sure that neighbors are aware of the system, its maintenance standards and contact information for customer service of the closest agency. Isofotón is also partnering with the government in Ghana to install solar pumping systems in agricultural applications. Isofotón’s commitment in Ghana dates back several years and in 1998, the company received $5 million for rural electrification projects within the framework of a Spanish government loan to Ghana. Another milestone for the Isofotón rural electrification portfolio took place in Bolivia. It consisted of supplying solar electricity to 17,000 homes, communal centers, schools and health posts in 4 of the country’s 6 regions over the course of 3 years. Eighty-five percent of this project is financed by the World bank through the International Reconstruction and Development bank, and the remaining 15 percent will be paid by users through fees and a microcredit system that is adjusted to their real payment capacity. The company also supports the efforts of its employees through the Energy Solidarity Foundation, an initiative they have created to help in the areas they are good at and where Isofoton may provide them with infrastructure and logistic support. The foundation uses its funds to carry out Rural Solar Energy Electrification projects in developing countries in order to improve the quality of life of the inhabitants of the neediest regions. Last June, WWF published a report about desalination. Its position is that this technology has a place in water supply, but one that needs to be considered on a case by case basis, with integrated approaches to the management of water supply and demand. Among other considerations, it stresses that desalination plants should be climate-neutral, obtaining their energy from renewable sources. In the aftermath of the debate that this report has sparked, the UK’s first desalination plant providing drinking water for Londoners and people in the south-east was granted government approval last week. Thames Water will operate the plant, to be designed and built by Acciona Agua. The site, in the Thames Estuary (East London) will provide up to almost 37 million gallons of drinking water a day – enough for nearly one million people. The plant will start producing water sometime in 2009, in times of drought or low rainfall. In line with the recommendations cited from WWF and the conditions set forth by the planning authority, Thames Water has confirmed that it intends to run it entirely on renewable energy, specifically, bio-diesel. Moreover, the idea of the company is to ensure that any disruptions to the environment are kept to a minimum; first of all, by actually enhancing the area, by siting the plant in a brownfield riverside location, recuperated for the project. Additionally, a thorough environmental impact assessment has been carried out and a team of ecologists will be employed throughout the project to ensure the protection of the local ecology. Per head of population, London is drier than Madrid and Istanbul. Nevertheless, some environmental campaigners have condemned the government’s approval of the plant. “The government should instead conduct a bigger, strategic review of people’s water usage and work to reduce demand and leakage, introduce metering in homes and encourage residents to install water-saving technology.” said Rob Oates from the World Wildlife Fund. Spanish inventors have created a highly energy-efficient Air conditioning unit. The Rotartica invented by the Spanish firm of the same name, is being tested by US researchers at Oak Ridge National Lab who say it could well be the most advanced air conditioner around. The air conditioning unit’s heat pump spins, using centrifugal forces to dramatically improve the heat and mass transfer inside the unit, making it more efficient, leading to reduced utility bills. The solar-powered model uses natural refrigerants that are harmless to the ozone layer and the unit operates without cooling towers. Ac units used in US schools and businesses are routinely damaged by thieves keen to steal its copper, which costs $2.75 a pound. The US will be pleased to hear that although the Rotartica looks similar to standard units used in the country, the invention has no copper inside it. The machine was made in Spain for a coastal environment and has a steel outdoor coil. A small camera inside the ac unit allows US researchers and Rotartica‘s inventors to monitor the unit’s performance from a computer screen 24 hours a day, seven days a week. Researchers expect the Rotartica unit will be available for purchase in the US within two years. The GTC turned its vast 10.4 meter (34-feet) wide mirror toward the skies and peered into space for the first time last Friday night. “The bigger the mirror, the more light the telescope can capture and the further it can see,” Pedro Alvarez, director of the GTC project, explained. At 01.00 hours (2300 GMT) on a crystal-clear night, Spain‘s Crown Prince Felipe keyed in the computer codes which brought the observatory’s complex machinery to life. The ceremony launched a final test phase for the €130 million (US$179 million) telescope, which is designed to take advantage of pristine, clear skies at the Atlantic island of La Palma. It should be fully operational by May 2008. Among those present for the opening was Brian May, lead guitarist of pop group Queen, who studied part of his doctorate in astrophysics at the Canary Islands institute. May is working on a musical score which will be played at the telescope’s inauguration next summer. 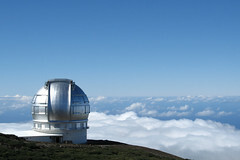 The GTC is located at the astrophysical research station of Roque de los Muchachos at the highest point of the Island of La Palma, 2,400 meters (7,870 feet) above sea-level. Construction work took seven years and involved more than 1,000 people from nearly 100 companies. Hauling parts of the telescope weighing a total of 500 tons to a height of 2,400m in the rough weather conditions of the winter months proved to be quite a technical challenge. “With this (telescope) it will possible to capture the birth of new stars, to study more profoundly the characteristics of black holes or to decipher the chemical components generated by the Big Bang,” the Canary Islands Astrophysics Institute said in a statement. The institute is considered one of the world’s centers of excellence in astrophysics owing to the special geographical situation of the islands, off the northwest coast of Africa, which offers unusually transparent skies. The cost of building the GTC was borne by Spain‘s Education and Science Ministry, the regional government of the Canary Islands, with partner astronomical institutes in Mexico and the University of Florida covering about 10 percent of the cost. 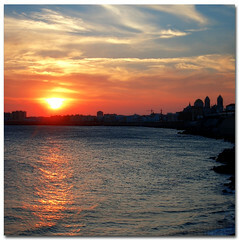 Endesa, Spain´s largest utility, has announced it is set to build that country’s biggest solar energy plant in San Roque (Cadiz, Andalusia). Company officials estimate that the 20.1 megawatt pv solar plant will save 13,300 tons of CO2 emissions a year. The decision to build a plant using this type of technology meets environmental criteria as these facilities produce no greenhouse gases whatsoever. The location is ideal not only because of the amount of solar radiation it receives but also because photovoltaic cells work better near the coast, where average summer temperatures are cooler, company officials said in a statement. The project is part of Endesa’s plan for development of clean energies, which proposes 100 megawatts of new solar energy in the next five years.The first stage of the plant will have 12.3 megawatts of installed power covering 91 acres. Endesa Generation will start work in July. In another sign of the commitment of the company to sustainable development, Endesa´s Northwest Hydro Production Unit has been recently awarded the UNE-ISO environmental management certification. The firm said that this marks the end of an exhaustive inspection of all Endesa hydroelectric facilities in Spain, based on detailed environmental and report diagnostics, underway since 2005. The certification accredits this Unit’s activities to be environmentally friendly, in line with the company’s other hydro plants, which have also reached this level of environmental efficiency. From its base in Northwestern Spain, this Hydro Production Unit manages 21 plants with a combined installed capacity of over 891 MW. You are currently browsing the Technology For Life weblog archives for July 2007.